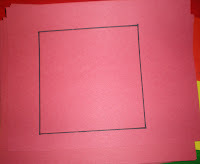 Since our Color Books are finished, we are starting a new book for shapes. 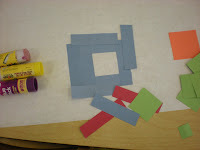 The first shape we explored was square. 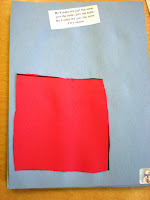 I have decided to start with square because our shape books include a lot of cutting and starting with four straight lines to cut is much eaiser than trying to cut in a circle. 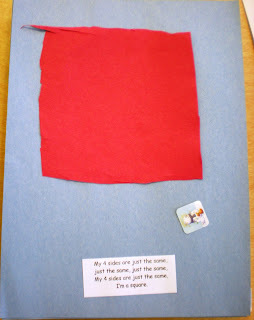 Here is our square song"
The first page of our shape book for square is to cut a square out, glue it to a piece of paper, and then add the words to our square song. I must say I was extremely proud of the children for their cutting skills. I had no idea they could cut so well. We did have to correct quite a few hands, but once they got going they did pretty well. The trick though? 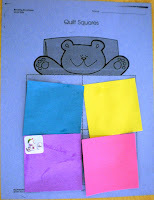 Retrieve the scissors as soon as they are done cutting out the shape. 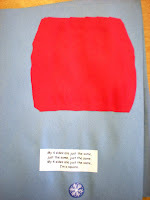 Otherwise, those scissors keep cutting and the children are usually left with square scraps. 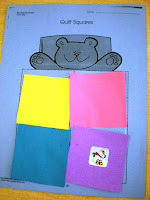 The following page for the square was to make a "quilt" using squares. 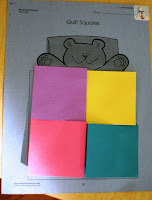 I had pre-cut squares they could glue to a paper to make the quilt. 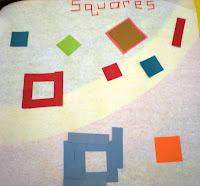 Another fun activity I had out for them this week was a large square piece of paper, some pre-cut squares, and some pre-cut strips. 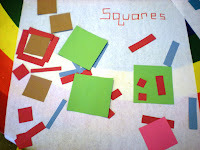 I let the children glue the squares and strips to the paper to see what they could create. The PM class enjoyed this a bit more than the AM class. 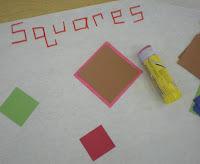 I also have squares that I give them to take around the room and look for objects that are squares. This always gets a bit tricky with the square/rectangle aspect, but they do a good job. One shape down, three to go. I love your unit on squares. The consistency you maintain in your classroom is wonderful! Will do this one too!